For those of us in Toronto who have long awaited the arrival of laneway housing as-of-right, it is now here, abeit in a confined area of the city thus far. Approved in June, it took the entire summer for the city to post by-laws as they pertain to this new housing type, which the real estate industry, property owners, and potential developers/end users are now assessing. 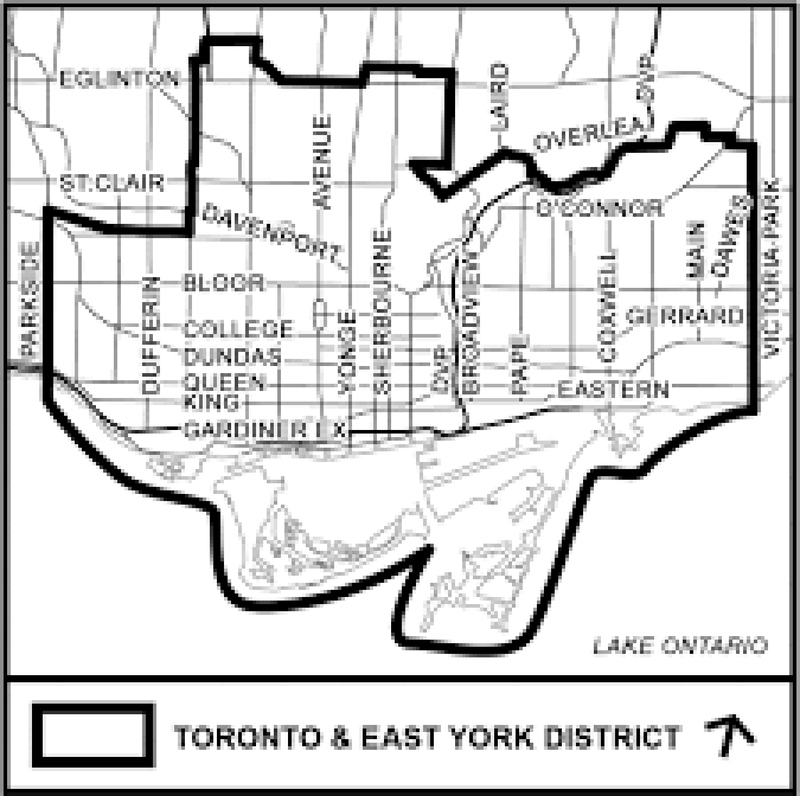 As a realtor working in the original City of Toronto for 26 years (including all of the city's geographic boundaries for laneway housing), I can assure you the interest is enormous. In fact, I already have Buyer clients keen to secure an underutilized property with laneway housing potential! With this development has come a lot of questions regarding laneway housing in Toronto, most surrounding what the new rules and limitations are for building a second domicile on a lot. Sifting through the packages on the city's 'Changing Lanes' website isn't difficult, but there's a lot of minutae! So, in the interest of creating a distilled verision, I reached out to architecture firm Sustainable for their take. I'm a big fan of Sustainable, who have helped me realize my vision for my own semi-detached purpose-built 60s duplex in Riverdale, documented in my Tales Of Tennis Crescent blog at Urbaneer.com. The bulk of the renovations will include extending the second floor and adding a third floor addition. The Toronto-based architectural firm is committed to delivering "healthy, affordable, and energy-efficient solutions", and, given my propensity to be 'high-design' (meaning I jammed a lot of inefficient expensive steel and glass cubes to my house in my original concept), they've helped edit my vision into one that is straightforward (read 'more economical') in its construction program, efficient in its space plan, and incorporates local sustainable materials while still reflecting my aesthetic. With the Building Permit ready to go on my house (which, incidentally, does not have a laneway - boo! ), the real work will be starting soon! If you're a fan of renovation blogs, stay tuned for more of my own journey renovating this Swell Dwell! 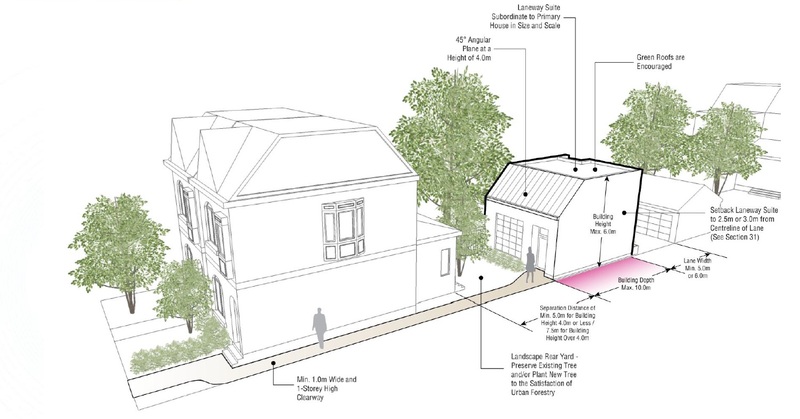 Here's Sustainable's summary, which answers the most important questions Torontonians might have about Laneway Housing, and serves as a great primer for anyone looking to build a laneway suite. If your property is inside the noted boundary, is at least 3.5 metres wide at the rear, abuts a lane by 3.5 metres or more, and allows for a maximum travel distance of 45 metres for emergency services (either through side lot clearance of at least 1 metre or proximity of the Suite's entrance to a public street) ..... good news! 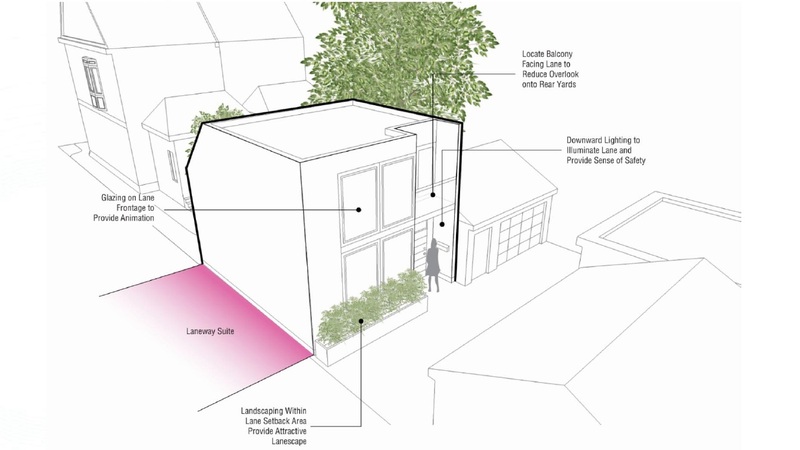 Your property may qualify for the development of a Laneway Suite. For those people in the middle of rowhouse units (with no side lot clearance), in the middle of a block (which is more than 45 metres from a public street), you may be out of luck. For now, that is. 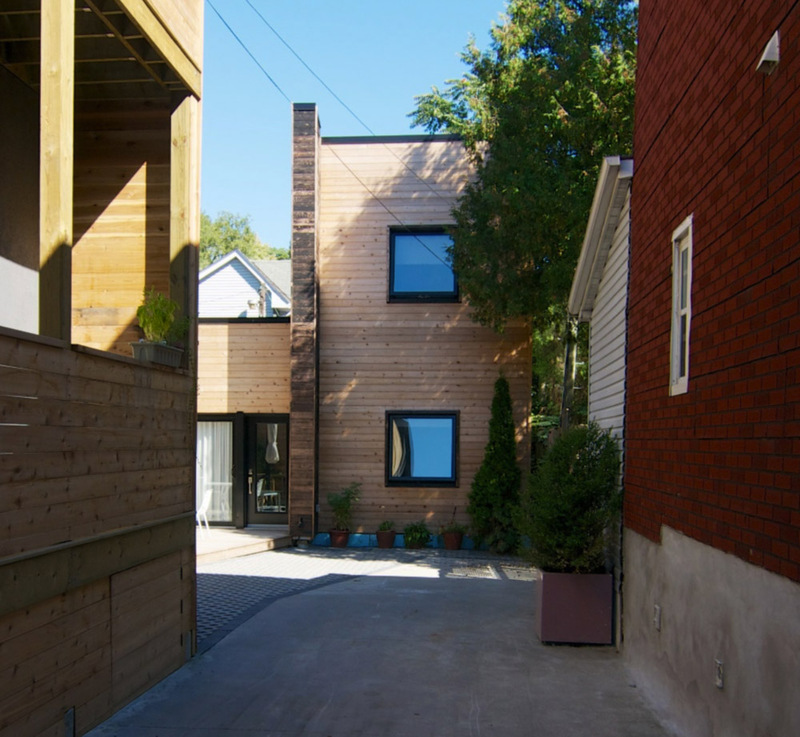 Just like principal residences, Laneway Suites are subject to a number of complex and sometimes overlapping zoning requirements. There are requirements for setbacks from property lines, separation from the principal residence, and soft landscaping for the property. There are also specific guidelines for building height based on the size and layout of your existing dwelling, and restrictions on the shape (or even existence) of the second storey if the Laneway Suite is too close to the Principal Residential Building. Some leeway is given for encroachment into the building separation by decks and canopies, and some flexibility is built into the process by not counting the floor area of a Laneway Suite against the total allowed on a lot. -street permit to replace their parking in instances where they are in an oversubscribed street parking area. If there is sufficient space on the property, the owner may incorporate a parking space within the laneway suite or elsewhere on the property, subject to any requirements related to the location of the space. If you are interested in exploring the opportunities in your laneway, contact Sustainable.TO for a for a consultation. As a realtor, the most frequently asked question by Sellers is "What's my laneway access now worth?". Unfortunately it's impossible to quantify as a generality, given the first step one must make is determine exactly how large a Laneway House can be built. In my blog called Exploring Toronto Real Estate Property Values I break down the three approaches to valuing property - being the Market Value Approach, Income Approach and Land + Development Cost Approach. Here you'd use the Income Approach to see how much additional income a Laneway House in that location would generate to the property and extrapolate it against building costs, taking into account whether you're losing parking space(s) knowing they currently have a value (though this value will depreciate as Self-Driving Cars and their proposed central hub systems become common place - apparently as soon as 15 years). 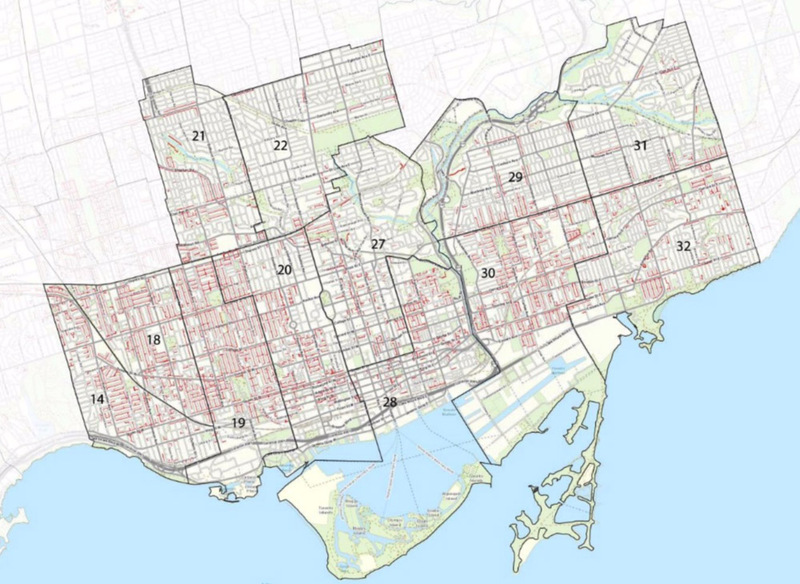 If you're taking the Income Approach you might also determine how much your current dwelling would earn as-is, or divided into more than one unit to establish how much an Investor might pay for the site, knowing that cap rates are shifting (and impacted by The Other Side Of Rent Control And Toronto Real Estate). Personally, I see this as-of-right accessory dwelling being really helpful for multi-generational families (explored in more detail in November 2017 - Home Of The Month - Scarborough) as well as existing owners who opt to build a laneway house for their own personal occupancy while turning the current dwelling into an income supplement. At the moment, no development charges are payable to build a laneway suite, but if you were to later apply to the city to sever the parcel (not legally allowed at this moment in time), or to convert the site into condominiums, then development fees would be retroactive. Development fees are costly - and increasing - since I last wrote about in The Pitfalls Of Permit Fees And Toronto Real Estate. Here's the link to the City Of Toronto Building Permit Fee page which says a Building Permit for a new build is $17.16 per square meter.